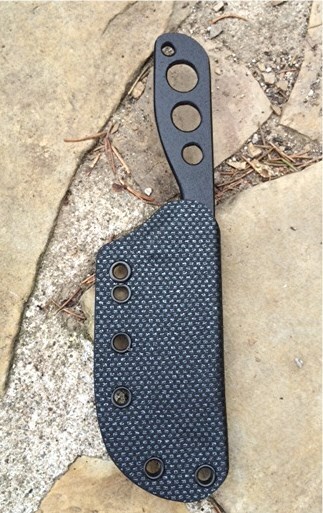 A handy Tactical blade that can be worn comfortably around your neck in a kydex sheath with a “break away” 550 para cord collar. 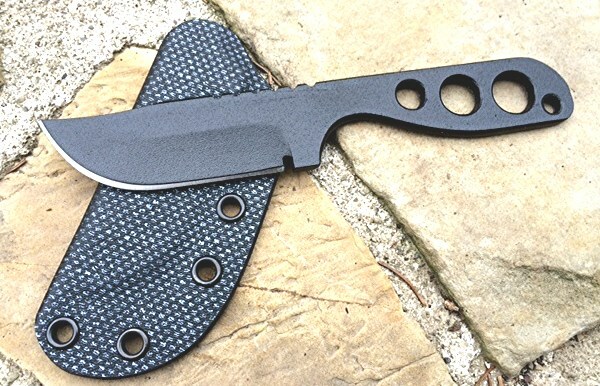 This Survival knife is 7″ long and 1 1/8″ wide. A tough blade thickness of 3/16″ makes this one serious tool. The handle area has counter sunk cut outs to reduce weight and handle panels or 55o para cord can easily be applied if desired. This little knife has the same Rockwell 57 hardness and grind as its big Tactical / Survival knife, or Bush Craft brothers. Currently comes in our standard Mil Spec Desert Tan Hummer Powder coat or Stealth Black. Tanker Grey and olive drab available on special order. The WASP will sting like one when you need to use it. The kydex sheath can be worn either around your neck or, with the belt attachment, horizontally or vertically. When you feel the 3/16″ heft in your hand you will know you have quality and performance. We have several and keep one in the glove compartment, one in our “Bug Out” bag, and one with our survival supplies. You have a choice of a drop point or a “stinger” point on your WASP. This entry was posted on Wednesday, June 4th, 2014 at 7:21 pm	and is filed under Uncategorized. You can follow any responses to this entry through the RSS 2.0 feed. Both comments and pings are currently closed.